There are times when I despair seeing the deplorable state of the medical profession in India today. People don’t hold doctors in high regard the way they used to, a couple of decades ago. Of course, patients still respect their personal doctor, but the broader perception is that doctors are corrupt (because they make underhand deals), unethical (as they take cuts) and greedy (because they over-test and over-treat in order to make more money). It seems like the reputation of the entire medical profession is in a free fall dive. It's easy to blame the declining state of medical ethics on the fact that society as a whole today, tends to prioritize professionalism over money. Commercialism is rampant and affects our society as a whole; so why is it that we expect doctors to be unsinged by this? Another fact is that a large number of private medical colleges are set up by politicians who want to make a quick buck. These colleges charge exorbitant fees and in order to recover them; new graduates end up overcharging patients. That’s the only way they are able to get a ROI on the capitation fees they coughed up to ensure that the “Dr” prefix gets added to their names. Regardless of how much doctors rationalize and justify this aberrant behavior, the fact is that it’s both unethical and illegal. So how can doctors amend their ways? Just having laws in place is never adequate. Passing a law is easy and it looks great in black and white; but the fact of the matter is that implementing them is an insurmountable task in India. In my opinion, the reason doctors don’t mend their ways is simply because patients allow them to get way with their deplorable behavior. How Can I Challenge My Doctor? It’s true that patients feel helpless and powerless and that there is a power imbalance in the doctor-patient relationship. When you are sick, the last thing you want to do is to challenge and confront your doctor. However, it is also equally true that by allowing doctors to get away with this behavior, patients are inadvertently encouraging this and he is never deterred from behaving badly with other patients either. But as the Rabbis say - "It's not the rat that steals; it's the hole that steals". In other words, if the rat (aka the thief) knew that he wouldn't have a hole to conceal what he steals from others, he wouldn't steal. Keep in mind that doctors can’t really survive without patients and the former don’t have a monopoly. The minute patients learn to put their foot down and say no, a change will not be difficult to come by. 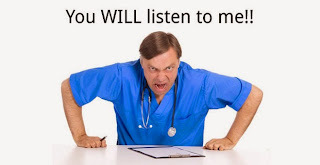 If patients are able to shrug off the cloak of complacency and muster up a bit of courage and begin punishing doctors for bad behavior, changes will take place. So, the next time you complain about a doctor, first ask yourself whether you took any steps to remedy the situation- if you did not, it also means you are part of the problem. The only way to expect some improvement in the way things around us progress is to be the change. 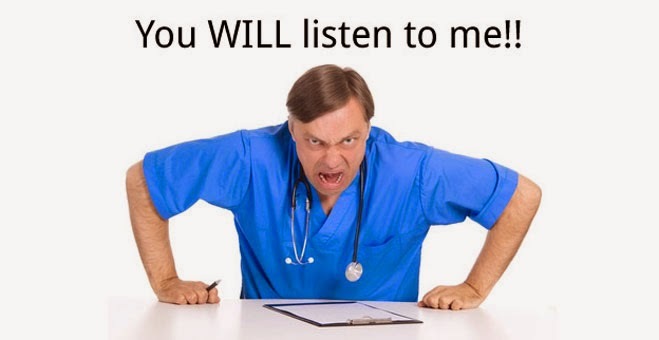 The only reason doctors sit atop pedestals is because patients are on their knees!